Royal Canin Sensitivity Control Dry Food for Cats is a carefully balanced hypoallergenic veterinary diet for cats with Adverse Food Reaction (AFR), food allergies or food/ingredient intolerance. 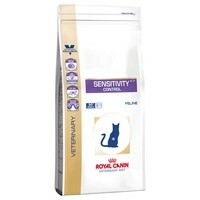 Made with a carefully selected source of hydrolysed proteins that have been chosen to help reduce the risk of your cat having an allergic reaction, Royal Canin Sensitivity Vet Diet contains a balance of nutrients and fatty acids that will promote a healthy digestive system by cultivating the good bacteria in your cat’s system. Royal Canin Sensitivity also contains high amounts of biotin, niacin and zinc to help strengthen your cat’s natural skin barrier and help protect them from external irritants. My 7 year old cat Opium suddenly started scratching, and biting at her paws, and seemed to be in pain about an hour after eating. I changed her diet to Royal Canin Sensitivity Control, Royal Canin Hypoallergenic and freshly cooked chicken breast. Brilliant foods with amazing results, no more pain or scratching/biting, a very happy fussy cat. I bought this food on a recommendation from a friend as my cat, who was a stray seems to get sickness quite a lot. He was on antibiotics for it which gave him diahroea, but even now he is off the medication he still gets diahroea. This food has probably helped with that to a certain degree but it would be great if I could find something that stopped the diahroea properly. He loves it though...nearly bites my hand off for it !! I have found the new formula to be just as good as the old one, and just as acceptable to my cat. So no problems with the change at all for us. My only concern would be if the duck is more fatty than the blue whiting, which might not be so good from a pancreatic point of view, but I cannot base this opinion on fact. I was really worried about giving my cat (with dietary sensitivity issues)this food when the flavour changed. However, we have had no problems and he still enjoys it. I've had my Cat on this for quite some time and she has always seemed fine and always liked it. In response to the previous post, since the change in recipe she isn't quite so interested and has gone off her food slightly. Although she hasn't been ill (that i have witnessed) and is still eating her wet food daily. The wet food i have her on (at the vets recommendation) is the Hills I/D tins. Therefore after noticing the change in her and reading your post I am going to order some of the Hills I/D biscuit to see if that suits her any better or helps her to eat more. In a few weeks i'll re-review to say whether the Hills I/D may/may not be better suited. I'd be interested to hear other customer's views on the new recipe. One of my Bengals who already has a sensitive stomach seems to be reacting badly to being introduced to the new formula. I've only added a small amount in, mixing it with my remaining blue whiting stock, but my cat is being sick several times a day. I will of course talk to my vet but just wondered if anyone else was seeing similar reactions? I can think of no other cause than the food but if it's not something others are seeing then I need to look elsewhere for the cause!